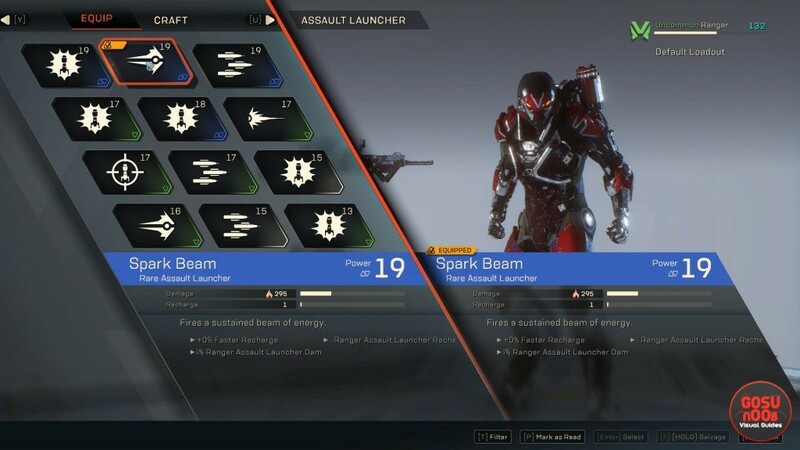 Ranger, Storm, Interceptor, and Colossus in Anthem are the four classes that you can play in the game. Each of the classes in Anthem plays differently, with class abilities to match. Which class you’ll play as and which abilities you’ll choose will vary from your playstyle, as well as which mission you’ll be playing. However, the choices can seem a bit overwhelming, and picking your ability loadout might decide whether you live or die. So, our Anthem Skills List & Combos – Ranger, Interceptor, Storm, Colossus guide will show you all the skills that the four different classes have and what they do, as well as how combos work, and so on. In Anthem, the Ranger is the jack-of-all-trades. It’s a perfectly rounded class, which is great both for solo exploits, and team play. The Ranger can be played both offensively and defensively, as a primer or a detonator, nearly whatever you like. It’s perfect for novice players, as well as those that don’t like characters that are too specialized. Frag Grenade – Detonator – Fairly standard but useful ability. It lobs a grenade that does AoE damage, and detonates all primed enemies withing the explosion radius. Great for clearing out groups, as well as doing a lot of damage to a single primed target. Inferno Grenade – Primer (Fire) – Similar to the Frag Grenade, in that it has an AoE effect. Unlike the Frag Grenade, it deals fire damage and primes targets for comboing. Frost Grenade – Primer (Ice) – Exactly the same as the Inferno Grenade, except it freezes enemies and primes them for detonation that way. Seeker Grenades – A grenade that, when thrown, separates into several grenades that home in on targets. It doesn’t prime or detonate; it only deals pure damage to several enemies; and quite respectable damage, at that. Sticky Grenade – Detonator – Exactly what it sounds like. A grenade that you can throw onto an enemy. Upon exploding, it deals blast damage, and also detonates primed targets. Seeking Missile – Detonator – Says it all in the name. It’s a single missile that homes in on one enemy, and detonates a combo if said target has been primed. Pulse Blast – Detonator – Similar to the Seeking Missile, except it doesn’t seek the enemy. It fires a single pulse blast, and also detonates the target if primed. Spark Beam – It’s a continuous beam that damages anything that comes into contact with it. You can focus it on a single target, or spread the damage out. Doesn’t prime or detonate, so if you’re looking for combos, this one won’t be of use to you. Venom Darts – Primer (Acid) – Fires two acid darts into a target, dealing damage and priming the enemy for a combo. Plain and simple, if maybe a little underwhelming overall. Blast Missile – A high-power projectile that explodes on impact and deals sizeable damage to both the target, as well as enemies around said target. So, it has some AoE action going, as well. Sadly, does not prime or detonate. Bulwark Point – Summons a shield dome that protects you and anyone on your team that’s inside the dome from enemy fire, while also allowing you to fire back through the barrier. It sounds like a tanky ability, but that just speaks further to the versatility of the Ranger. Muster Point – Also creates a dome, which buffs weapon damage to you and all allies that are inside the affected area. Shock Mace – Primer (Electric) – You can hit a single enemy with this, or jump into the air and slam it to the ground for AoE. To sweeten the deal, it primes enemies for combos. Man, the Ranger sounds good. Multi-Target Missile Battery – Detonator – Starts with red crosshairs, which target multiple enemies as you move around. Then, it fires a frightening amount of rockets into targeted foes. If there are less enemies than rockets, then each will get multiple rocketfulls of blast damage into the rump. Plus, the blasts detonate primed enemies, and you’re invincible while it lasts. What more could you want from life? The Interceptor in Anthem is basically the DPS. If you like playing rouges in RPGs, this is probably the class for you. The Interceptor is fast and nimble, able to hop into the fray, deal as much damage as possible, and then bail. And, the abilities the class has all revolve around that. Interestingly, the Interceptor is much more about melee combat than you might think. The class is extremely useful on the battlefield, but also arguably the most difficult to play. Searching Glaive – A single projectile that homes in on an enemy. It does substantial damage, but doesn’t prime or detonate. Not bad, but nothing special to write home about. Venom Bomb – Primer (Acid) – Grenade that, upon exploding, unleashes a cloud of acid gas that covers a decent area, and also primes targets for comboing. Cryo Glaive – Primer (Ice) – A glaive that hits one target, then bounces to a second enemy, freezing them both. Since it’s a primer, it lets you combo two targets. With the Interceptor’s speed and agility, that’s basically a two-for-one deal. Cluster Mine – Creates several land mines. Enemies can trigger these mines by walking over them, but the mines will also explode if you place them right under your targets. Plays nice with the Colossus’s ability to lead enemies towards him. Doesn’t prime or detonate. Spark Dash – Detonator – You dash forward at a blinding speed, leaving a trail of electricity behind you, and detonating enemies that you or someone else has primed. Another ability that plays to the Interceptor’s ability to get in and out of trouble fast. Detonating Strike – Primer (Electricity) – A melee strike that primes targets for comboing. If the target already has the Electricity effect on it, it’ll then explode and deal AoE damage to enemies within the blast radius. Why they decided to name it Detonating Strike when it actually primes targets, I couldn’t tell you. Plasma Star – Five-charge ability that let’s you shoot shurikens into enemies at fast speeds. It does decent damage for a single-fire ability, but it doesn’t prime or detonate. Wraith Strike – Another ability that doesn’t prime or detonate, but it’s fun to use. It fires a ghostly-green projection of your Interceptor, which deals a great amount of damage to every enemy it comes into contact with. It’s handy, because it keeps you out of the fray, if you need a breather, while still keeping you the DPS. Tempest Strike – Detonator – A melee attack that turns you into a combo-detonating tornado. It deals buckets of damage on top of everything. Fantastic to getting into the fray, using the combo effect to get the elemental aura (more on that below), and keep mowing enemies in close quarters. Venom Spray – Primer (Acid) – Fires a mist of acid in front of you, priming all targets in range of the green cloud for comboing. Target Beacon – Places a beacon upon a single target. The marked target takes substantially higher damage while the beacon is active. It’s fantastic for taking down high-value targets like bosses. Whether you’re playing solo or in a squad, this ability will be extremely useful. Rally Cry – This ability is handy when playing solo, but much more so in a squad. Rally Cry lifts all elemental effects from you and all allies that are in the ability’s range. So, if you and your team are, say, frozen or burning, use Rally Cry to get rid of those problems. Bladed Daggers – Detonator – This is the Interceptor’s main weapon, basically. The ability has no cooldown, so it allows you to be the buzzsaw on the battlefield. If that wasn’t enough, they do great damage, while also detonating targets to boot. It’s a spectacle to behold. Assassin’s Blades – Detonator – Triggering the ultimate buffs the damage of your Interceptor’s melee attacks significantly, plus detonates primed targets. Oh, and you’re invincible while it lasts. Can you imagine the mayhem you’ll be causing with this? The Storm in Anthem is the glass cannon, the wizard, the caster. If you’ve played RPGs before, you know what we’re talking about. The Storm can cause a lot of damage to enemies, as well as prime bunches of enemies for detonating combos, but can’t take much punishment before keeling over. So, the majority of this class’s abilities hinge on staying back, well out of harm’s way, and raining destruction as well as priming targets for others, all from a safe distance. Lightning Strike – Detonator – Summons a bolt of lightning that does damage to all enemies within the radius of the blast. Plus, it detonates all primed enemies to create a combo. Ice Storm – Primer (Ice) – Fires several blasts of ice (hold down the ability to deal even more chaos), dealing damage to anything the projectiles hit, while priming targets for combos. Flame Burst – Fires several powerful blasts of fire that deal substantial damage to anything within the AoE. Good stuff, even though it doesn’t prime or detonate. Ice Blast – Primer (Ice) – Triggering the ability lobs several frosty chunks at enemies for good damage, while freezing and priming enemies for combos. Living Flame – Primer (Fire) – Shoots a fireball that bounces from enemy to enemy, setting them ablaze. This both deals fire damage and primes enemies for further combo punishment. Frost Shards – Primer (Ice) – Shoots a rapid volley of icicles, almost like a machine gun. Targets hit by this get slowly frozen (the number of shards that need to hit them depends on how powerful the enemy is), thereby priming the target for combos. Burning Orb – Detonator – You can either shoot five fireballs in quick succession, or hold the button for one huge, single blast. That’ll vary on your situation, to be sure. Not only does it deal fiery death; it also detonates all primed targets that get into the blast radius. Shock Burst – Primer (Electric) – A ball of lightning that bounces of walls and primes the target for detonation when it hits. Glacial Spear – Detonator – A powerful, if brief, ray of ice. Deals significant damage, plus detonates primed targets for combos. Arc Burst – A lightning bolt that spreads from enemy to enemy upon impact. It lets you incapacitate several targets for the price of one, so it can be useful. However, it doesn’t prime, nor does it detonate combos. Wind Wall – Exactly what it says on the packaging. Creates a wall of air a ways in front of you. This protects you and your allies, and it also lets you fire through it. A good substitute for, say, the Ranger’s Bulwark Point. It does only protect you from one side, though, so be careful. Quickening Field – An extremely useful ability. It creates a domed field. For you and any allies inside the field, cooldown times will decrease dramatically. This is a huge perk for everyone involved, but especially the caster that the Storm is. Fiery Strike – Detonator – You punch an enemy with a fist of fire, and you’ll detonate a combo if you smack a primed enemy. That said, you should probably use this only as a last resort. Sure, it looks cool and all, but as a Storm, you want to be as far away from punching range as you possibly can. Elemental Storm – Primer and Detonator – I love this one just for the sheer catastrophe it rains upon opponents. Unleashes Ice, Fire, and Electricity AoE attacks that decimate anything they touch. Not only that, but the elemental blasts intermittently prime and detonate combos. So, get ready for a screen covered to the brim with devastation. This attack alone warrants an epilepsy warning. The Colossus is the tank, and it’s role is all about diverting aggro to themselves, while protecting the rest of the team, and/or opening enemies up for them. The Colossus is super slow, but hits really hard. Plus, it’s the only class that can carry the heaviest weapons. The abilities of the Colossus are all about dealing a lot of damage, and also creating opportunities for allies to strike or detonate or what-have-you. High Explosive Mortar – Detonator – Fires a rocket in an arc that does pretty good damage in an AoE, while detonating all enemies that are primed and unfortunate enough to find themselves in the blast radius. Burst Mortar – Shoots several rockets in an arc that cause blast damage to all enemies inside the AoE radius, which is pretty wide. While it certainly does great damage, it doesn’t prime for combos nor detonate them. Firewall Mortar – Primer (Fire) – A fun ability that launches a mortar in an arc, which creates a wall of fire upon impact. The game will show you where the wall will appear, and how wide it will be. All enemies that come in contact with the wall will be primed for combos (if the effect stacks high enough, of course). Lightning Coil – Detonator – This ability has ten charges. When activated, it fires bolts of electricity into one enemy in front of you. If you time it right, you can detonate up to ten targets with this ability. Oh, and it fires even with your shield up. Shock Coil – Primer (Electricity) – Forms a kind of circle of electricity around you, and primes enemies for comboing if they come into contact with the lightning for long enough. Also, like the Lightning Coil, it has ten charges before it needs to cool down. Siege Artillery – Detonator – Nothing especially interesting, but definitely powerful. A single rocket that deals hefty damage to one target. It also detonates a combo on said target if you’ve primed it first. Flamethrower – Primer (Fire) – Fires a jet of fire. There are a hundred charges which count down whenever you’re firing the flamethrower. It primes enemies for combos while dealing a lot of damage. You can use it either to prime a whole bunch of targets, or just destroy them outright. Flak Cannon – Kinda like a giant shotgun, with two charges. Deals massive damage to one target with the scattered shot. Really, it’s not much more than a giant shotgun. Doesn’t prime, doesn’t detonate, but it sure does pack a punch. Especially at close range. Railgun – Detonator – Shoots a single, powerful slug at a single target. The longer you hold it down, the harder it hits. If you’ve primed the target first, the Railgun will detonate the combo. Venom Spitter – Primer (Acid) – Fires a volley of projectiles in quick succession. It has ten charges, and it primes enemies for combos on top of dealing acid damage. Battle Cry – Taunts all enemies in a wide range in front of you. This has a two-fold, and super-useful effect. For one, it lures all enemies to attack you, diverting their attention from the rest of your squad. It also lowers elemental (and other) resistances of all enemies under the effect of the taunt, allowing for more efficient priming for combos. Shield Pulse – Releases a pulse in a very wide range. Both you and allies inside the pulses’s radius get defense buffs, thereby decreasing the amount of damage you all take. Fantastic for Colossi that play more defensively. Heavy Smash – Detonator – The Colossus punches the ground, dealing a small AoE. It detonates all primed enemies that you hit. Siege Cannon – Detonator – A truly devastating ability. You take out a gigantic cannon that fires rounds which deal tremendous blast damage, while detonating all primed targets it hits. Fires as many rounds as you can fit in while the ability lasts. You can squeeze in about five or so shots if you’re firing into a single target that isn’t moving too much. First off, let’s explain how combos work in Anthem, in case you still haven’t figured it out. The first step is the Primer, which commonly inflicts some kind of elemental effect on the target. Not all elemental attacks are Primers, so be careful there. The next step is the Detonation. Check out the list above to see which different abilities act as Detonators. This action executes the combo, which usually deals more damage to the target, as well as causing other effects, depending on which class ends up executing the combo. We’re gonna get into that now. Quick sidenote before we continue, though: the Javelin that detonates the combo will get the effect. Got it? Great; let’s go over the different combo effects for each of the classes. Ranger Combo Effect – When you detonate a combo, you deal bonus critical damage to the single target that you detonated the combo on. It’s fantastic for dealing a lot of extra punishment to one, tougher enemy, such as, say, a boss, or some other kind of high-value target. Plain and simple. Not a lot of flair to it, but keeps the Ranger a great, super-useful option for both solo and squad missions. Interceptor Combo Effect – When you detonate a combo, you get an elemental aura equivalent to the primer element. So, if the target was primed with, let’s say, acid, you’ll get an acid aura for a little while upon detonation. This works wonderfully with the whole concept of the Interceptor being a fairly melee-focused class. This is because the elemental aura allows you to stack the effect on enemies that you come in close quarters with. That way, it incentivizes melee combat. Storm Combo Effect – Detonating a combo with the Storm spreads the elemental effect of the primer onto enemies around the detonated targets. This is a fantastic ability that gels wonderfully with the Storm as a class. The Storm is a glass cannon, so you really want to stay as far as you can from trouble. The combo resulting in even more enemies affected with elemental effects allows you to do what the Storm is meant to do in ideal circumstances: massive chain damage from afar. Colossus Combo Effect – The Colossus detonating a combo causes an AoE explosion, which damages all enemies within the radius. It’s kinda like the Ranger Combo Effect, but instead of damaging a single enemy for extra damage, it hits several targets. It allows the Colossus to execute more crowd control, which is one of the things that the Colossus is basically meant for. So, which skill loadouts should you pick in order to be the most efficient, and to execute combos as best as possible? Well, that will depend entirely on a bunch of circumstances. For example, whether you’re playing the mission alone or in a squad, the nature of the mission, and which class you play as. Let’s say you’re playing as the Ranger. With him, you’re well equipped both for solo and team play. Just as long as you keep one Primer and one Detonator, you’re golden. On the other hand, more specialized classes require some maneuvering. For example, the Interceptor doesn’t require a Detonator. This is because their main weapon, the melee attacks, are detonators. So, as long as you have efficient Primers slotted, you can rain a lot of death and damage. What about the Storm? Well, let’s say you’re playing in a team. You can play either as a full-on Primer, or a full-on Detonator, if you want. It all depends on the structure of your team. All in all, your loadout will depend, first and foremost, on your preferences. So, take the list above, study it, and make your decision. Good luck!